Arjun Kapoor And Athiya Shetty Caught In A Long Conversation At Varun Dhawan’s Birthday Bash! [tps_footer]Arjun Kapoor is making all the headlines these days for his personal life. The young actor who was last seen in the film ‘Ki and Ka’ is grabbing all the eyeballs for his relationship status. 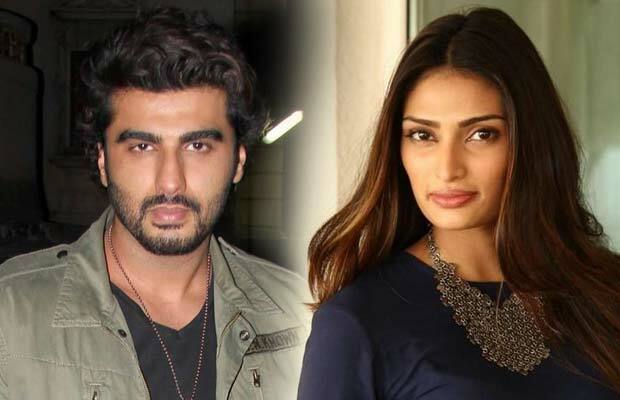 Arjun who is one of the most successful actors in the young lot is now being tagged with new entrant Athiya Shetty. Rumors regarding Arjun and Athiya are not new and have been floating since quite a long time. Recently, paparazzi were abuzz with the fact that Arjun and Athiya were engrossed in a deep conversation at Varun Dhawan’s birthday bash. Varun recently celebrated his birthday and all the biggies of tinsel town were invited. It is being said that the two talent bundles were lost in their conversation and everyone at the bash could not ignore that fact. Additionally, the two stars made separate entries at the bash. The Hero actress was not just seen chatting with the Ishaqzaade actor but was also seen talking with Anshula (Arjun Kapoor’s sister). It is well known that Athiya Shetty and Anshula are best friends and the two often hang out together too. Well, that’s not all, a while ago the 2 States actor was also seen with actress Malaika Arora Khan. Other than Athiya, Arjun has startled the shutterbugs with his outings with Malaika. The glamorous actress is living separately from husband Arbaaz Khan and rumors regarding Arjun and Malaika have been making rounds since a long time. Well, in a short span of time, the Kapoor lad has surely shocked the masses.